Did you know New York and San Francisco are not the only cities with Chinese populations in 19 century? 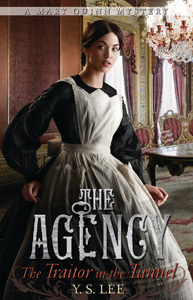 If I didn’t read The Agency trilogy, I’d never know there were sailors in London during the Victorian Era. It was a time when being a Chinese is not a good thing, being Chinese, Irish and parent-less made it impossible for the main character Mary Quinn to survive. But with help from two amazing ladies she was saved and thrived. YS Lee not only gave us a view of the upstair/downstair at the time, she gave us powerful and smart female characters who find ways to use their disadvantage into something incredible. I like the series not only because the idea is original, YS Lee writes only what’s needed, I was never tempted to skip a paragraph. This is what I value the most as a person who reads as a writer. The last Agency book not only sped up the pace compare to the previous two volumes, it shows how Mary finally came into her own after what she went through in the book. Mary like everyone could have choose to sink into darkness but she choose to not only stay strong, she wants to live doing what she love to do. We all do, as Mary, have choices, it all depends on what you decide to see. Although The Agency series has ended, I hope to follow Mary into her new phase of life which I’m sure will still be a thrill a minute. This entry was posted in I Read This and tagged Books I'll Always Remember, mystery, The Agency, The Traitor in the Tunnel, victorian era, YS Lee by n2n. Bookmark the permalink.